More than 60 leading scientists - including Nobel laureates, leading medical experts, former federal agency directors and university chairs and presidents - issued a statement calling for regulatory and legislative action to restore scientific integrity to federal policymaking. According to the scientists, the Bush administration has, among other abuses, suppressed and distorted scientific analysis from federal agencies, and taken actions that have undermined the quality of scientific advisory panels. In conjunction with the statement, the Union of Concerned Scientists today released a report Scientific Integrity in Policymaking that investigates numerous allegations in the scientists' statement involving censorship and political interference with independent scientific inquiry at the Environmental Protection Agency, the Food and Drug Administration, and the Departments of Health and Human Services, Agriculture, Interior and Defense. 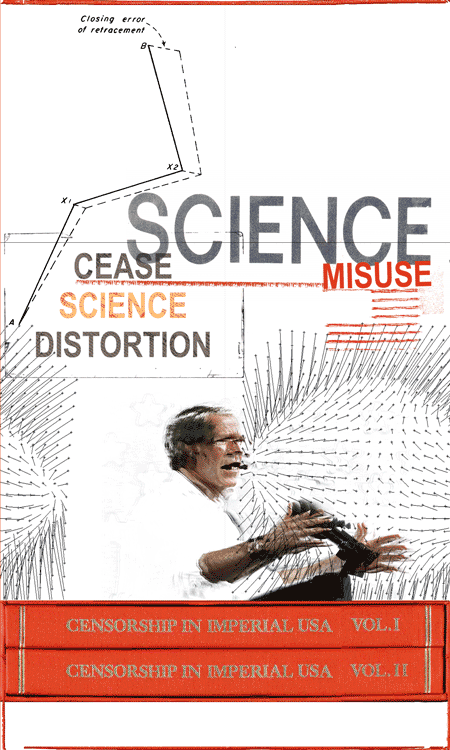 The statement demands that the Bush administration's "distortion of scientific knowledge for partisan political ends must cease" and calls for Congressional oversight hearings, guaranteed public access to government scientific studies and other measures to prevent such abuses in the future. The statement further calls on the scientific, engineering and medical communities to work together to reestablish scientific integrity in the policymaking process. >from *Preeminent Scientists Protest Bush Administration's Misuse of Science*. Nobel Laureates, National Medal of Science Recipients, and Other Leading Researchers Call for End to Scientific Abuses. February 18, 2004.